Industrial Metal combined with a commercial flair sure to intrigue a wide range of hard rock lovers. Emigrate, the first side-band project created by Rammstein guitarist Richard Kruspe, is sure to receive international acclaim from rock fans around the globe. Evidenced by the first single, “My World,” this album truly rocks with some heavy crunch guitar rhythms and cool sonic textures supporting the newly introduced lead vocal work of Kruspe himself (he never sings at all in Rammstein). For fans of the German multi-platinum selling Rammstein, there is no mistaking the heavy driving guitar sounds and strong downbeat rhythms found in these compositions. However, having been influenced by the mystique of New York City and American pop/rock culture (he recently moved to New York), Kruspe takes his musical feel and expression to a different level than where it goes in his primary band. The opener of the CD, the title track, “Emigrate,” is sure to catch your attention with its industrial sounding percussive drum beats and mystical instrumental harmony lines supported by a thick wall of heavy guitar. The vocals add intrigue throughout the CD by containing a harmonic distortion characteristic that truly could become a signature stamp of Kruspe’s. Transitioning into the second track of the CD, “Wake Up,” the listener can’t help but feel a build in tension and adrenalin as you feel the very “Rave”-ish type of feel. And by the third track of the CD, you will find yourself fully pumped and ready to take on the world, or in this case, “My World.” The driving, high-gain rhythm guitar on this is track is anything but tame, and in conjunction with the thick backing vocal track during the bridge, there is no mistaking the power of youth and wanting to take ownership of one’s existence. The first three selections of this CD will definitely make you increase your driving speed before you know it! “New York City” is a standout track, definitely inspired by the surroundings and vibe of the city across the bridge from our headquarters. The most pop influenced song on the CD, it even features a U2 type guitar riff and pop oriented backing gang vocals. The lead guitar section of “New York City” is typical of pentatonic rock riffs and definitely contains that East Coast flair – complimentary to the vibe and message of the lyric. Besides the handful of heavy, industrial rock tunes and the pop flair of “New York City,” the album is awash in other textures that come more from the world of alternative rock than metal. If the song selection were slightly re-arranged, you might even mistake Emigrate for an alternative rock with a few really heavy tunes instead of a metal outfit that is creating a truly diverse pallet of sound. Richard’s lyrical writing is as captivating as his musical compositions. He has a great talent in creating a musical foundation that further enhances the meaning and feel of the lyric. Having listened to the album quite extensively, you can definitely sense a type of vibe and see the connection between songs depicting a certain state of being – quite possibly a reflection of Richard Kruspe’s current state of mind! As with all artists, real expression and creativity comes from within. And when that expression is truly real, you wind up with your best work and material that can significantly impact the listener. Richard is definitely an artist creating real music that impacts the listener. MusicPlayers.com had the opportunity to interview Richard Kruspe and get an inside look at his first solo, er… side-band, album. Be sure to look for our Richard Kruspe feature to be published in January’s edition. The album Emigrate is scheduled for domestic release January 28, though it’s already available throughout Europe. If you would like to check out a few of the videos from the new album, just go to http://www.emigrate.eu/Video. Greece’s finest export since olives and humas! Hyperpyrexia: a condition in which the body’s baseline temperature is elevated above 106 degrees. While most people would find themselves seeking medical attention, it’s apparent that Theodore Ziras chose instead to shed some of that excess heat by heading to the studio to unleash a pyrotechnic assault upon both his guitar and our ears! Think Yngwie meets Dream Theater and you’ll have a pretty good idea of what to expect from each of the ten tracks featured on his third instrumental release. Hyperpyrexia provides an excellent showcase for Ziras’s highly refined chops as well as his penchant for busy, intense orchestrations, which, we can only imagine, were influenced by his collaboration with ex-Dream Theater keyboardist Derek Sherinian. All the standard shredder ingredients are present including sweep arpeggios, flowing legato passages, hyper-speed muted alternate picking, and some two-hand tapping thrown in for good measure. The flip side of all this technical perfection is that Ziras’s playing and composing can sound a bit too machine-like at times. We’d really love to hear some more emotion form this very gifted and talented performer. As it stands, while his playing is impressive, he has yet to develop a truly signature voice and sound that you would easily recognize amongst the numerous instrumental shredders. While not really breaking any new ground, the album does have some truly memorable moments. One of our favorites was the tune “Rapid Eye Movement,” which opens with a blistering unison guitar/keyboard passage that definitely grabbed our attention. Further along you’re treated to some truly mind-boggling sweep passages that would make Frank Gambale proud! Outside of the guitar work, the album features some incredible soloing from keyboardist Sherinian. His playing can be so over the top, it’s hard to fathom how one can be so expressive while dancing along the keyboard at Mach 3. Laying the foundation for all of this sonic mayhem is the drum and bass team of Brian Tichy and Manos Markopoulos. Additionally, we would like to have heard some vocals to break things up — the songs tended blend into one another after a while. Perhaps some changes in tempo would be nice as well since most of the tunes seem to be played at a similar pace. In the end, however, if you’re a fan of at-the-limit playing that goes to eleven all of the time, this album will be a worthy addition to your library. It’s worth every penny we spent on it! In case you haven’t heard, Radiohead are giving away their new album, In Rainbows, as a download for whatever voluntary price you’d like to send them! It’s refreshing to know that artists aren’t forcing you to spend a lot of money for mediocre music! At this point in time, it’s hard to think of Radiohead as a rock band, because although they have a few (and really, only a few) up-tempo songs, they’re just too sedated to really consider them a rock band. It’s really more like alternative noises and textures than anything resembling rock music. Can these guys even see through the haze of the opium den? Robert Smith never lulled us into such a depressed state of existence, but that could be because he never forgot how to write hooks and melody lines. In Rainbows contains the typical Radiohead ingredients — guitar sounds mangled beyond recognition, synth textures, drum loops and break beats, jazz-inspired bass lines, and of course Thom Yorke’s whiney, desparate, soprano voice. The performances are excellent, and especially notable would be Colin Greenwood’s bass playing. Unfortunately, like most Radiohead albums this side of The Bends, there’s not much to latch onto and actually remember here, though “Weird Fishes/Arpeggi” made us sit up and take notice, with its delicious blend of melodic guitars with U2-esque vocals and Stuart Copeland-esque drumming. If you’re a die-hard Radiohead fan, you’re certainly going to enjoy this album, though it doesn’t break any new ground for the band. But if you’ve been a casual fan who never understood why they didn’t continue writing songs in the vein of “Creep” or “High and Dry,” save your money and skip this album. Oh wait — you can download it for free, but then you’d still be giving up valuable disc space. Great sounding NYC club performance. 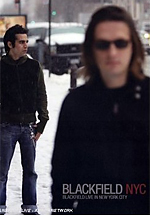 Blackfield is the band fronted by Porcupine Tree’s Steven Wilson and Israeli songwriter Aviv Geffen. Together with a band of talented Israeli musicians — keyboardist Eran Mitelman, bassist Seffy Efrati, and drummer Tomer Z, they produce music similar to the most commercial of Porcupine Tree’s material (think “Lazarus”), but with other influences ranging from Coldplay to David Bowie and more. Captured this past spring at NYC’s Bowery Ballroom, the DVD was edited by Lasse Hoile, but don’t expect the cinematic filmmaking that he creates as visuals for Porcupine Tree — this is a straight-up club performance with no frills. Just a band, some standard club lighting, and great music. Mixed by Steven Wilson, the sound is expectedly great. The performance captured songs from both Blackfield albums as well as an interesting remake of Alanis Morrisette’s moving ballad, “Thank You.” Musically, the performances are great, though at times, vocalist Geffen sounded a little wobbly. What was interesting to us, having never seen Blackfield perform live, was seeing just how much of the lead vocals are performed by Geffen. From the CD recordings, it isn’t nearly as obvious. Bonus materials on the CD include a few videos produced by Hoile (from the first Blackfield CD), and these feature some of his signature “old film” style. There is also a tour photo gallery. Horrible acting makes you laugh at an otherwise great band delivering a classic concept piece performance. 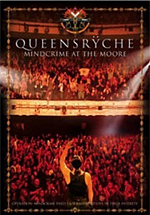 Filmed in their hometown of Seattle, this isn’t merely a Queensryche concert, but a cinematic performance of Operation Mindcrime I and II in their entirety. Spanning a two-CD set, the concert features Geoff Tate starring in a musical of sorts, along with Sister Mary and a host of additional actors, while the band performs the albums from start to finish. Two things were quite clear to us after watching this concert: Geoff Tate still has the pipes — he’s a strong vocalist with a soprano range. However, he should stick to singing and forget about acting. The performances were almost comically poor, and while it was a clever concept to enact the material live, the “show” took away from focusing on the band and its great music. Bonus materials included a tour documentary, a live performance of “The Chase” with guest Ronnie James Dio (no comparison to Tate’s voice), and more.